Gear.Club Unlimited may have its work cut out drawing away Switch players from Mario Kart 8 Deluxe but the console's first "proper" car racing game is still shaping up very nicely indeed. The latest trailer shows off the game's eye-catching visuals and goes some way to detailing the content and features contained within. As we already know, the game offers 400 races across 200 unique tracks - which include rally stages - loads of famous cars from real-world manufactures and in-depth car customisation. There's also a time attack mode where you can race against ghost cars and a four-player split screen mode. The game was previously confirmed for December 1st release, but the trailer says November 21st. We'll try and find out what's afoot and update this story when we know. Microïds and Eden Games announced today that Gear.Club Unlimited will be released on November 21 for download from the US Nintendo eShop and as a temporary exclusive at Gamestop in its boxed version, only in the United States and Canada. To celebrate this news, players can discover new features in the enclosed trailer of the first racing simulation game accessible to everyone on Nintendo Switch! The Performance Shop is a fully personalized garage where players can customize and improve their vehicles! It can be fully furnished by the players, who will choose their workshop locations, showcase their cars and can even choose the color of the floors and walls! 7 workshops are available to improve and personalize vehicles. With the Nintendo Switch's multiplayer features, players will race and compete with up to 4 cars on the same console split-screen mode on their TV set or Nintendo Switch TV or tablet. They will be able to drive the 32 cars available in the game as well as the models they will have customized in campaign mode. 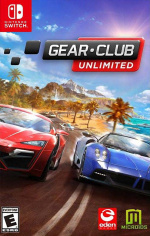 Gear.Club Unlimited is developed by Eden Games and published by Microïds, it will be available on November 21 on American Nintendo eshop and as a temporary exclusive at Gamestop in its boxed version. The game will be released on December 1st in Europe (physical and digital versions) and on December 14 in Japan. The game is rated E for Everyone. Will you be hitting the grid with this promising racer? I heard that they're charging €30-40 for this on Switch, can't remember the exact price. Wasn't it free on mobile? I'll do a check for the price. in the trailer says "available november 21"
@SLIGEACH_EIRE Yes it was and they better be making a lot of improvements and adding more content to justify that price point. I mean it does look good and possible the best looking racer on a Nintendo system ever. Hoping they get this right as I need a good SIM racer! As long as it runs at 60 fps and is fun in single player I'm interested. I hope 2 player also runs at 60. I wish everyone would cut polygons and texture maps way down to get 60 fps in 4 player splitscreen modes! Besides the price tag. What's the difference between the switch version and the free one on Google play? I just played it and then uninstalled it from my Motorola pure x 2 phone. Hell no! It's a ps2 game. It controls well which is good, but looks like crap. @SLIGEACH_EIRE go and download it on mobile. Tell me how far you get without paying when it comes having Access to all cars and tracks. I am not saying it's worth £45 by any means as haven't seen reviews yet. The argument that it's free on mobile is so flawed though. Noice. Looks right up my alley. Does anyone know if you can put vinyl on the car? It briefly showed it in one clip but I have not seen much else other than racing. For me I want more customization. I would prefer a Cruis'n style game... or Burnout WITH Crash Mode! Love racing, love cars, but there’s no way I’m buying this mobile game port. It’s free on mobile and is rubbish. Is it just me, or do the trees look like they have some dimensions and not like paper anymore? At any rate, it’s looking pretty good from visual standpoint, but I have never been one for realistic racing simulators, and it’s not like I have a shortage of things to play. My dollars are looking for a new home and this game may just be that but before I do here's two middle fingers to the piece of crap that is Project CARS. Are these people clogging November with games on purpose? @SLIGEACH_EIRE what's cheaper, $45 or "free on mobile"? You'd think most people would know the answer by the late 2010s. @Captain_Toad Better to release in November. Right in the middle of the holiday shopping season which is good for getting the early adopters, impulse buyers and gives enough leeway to hopefully accommodate stock for the "Oh wait the holiday my family celebrates is TOMORROW, I need a game" people...I hate those people. Also, happy to see your name sake getting lost/"exploring" in Mario Odyssey. I've sunk 500+ hours into Real Racing 3 on mobile (and not spent a penny) so I have my fingers crossed for this. The cars don't look hugely brilliant though, in the video. Looks gorgeous and enjoyed Test Drive Unlimited from these guys, may well check it out! Really hoping this is a solid game. Even though I already have way too many racing games to play this holiday season, looking forward to a racing game on the switch. Definitely interested, I’ll probably pick it up when it comes out if it gets good reviews. This is just some crappy phone game. I would buy a decent racer developed on the Switch though. Ports of mobile games will never get my cash. I don't think it looks too bad to be honest. If it were about £10-15 on the eShop I'd give it a go. @Davidiam007 From what I gather, they re-did the graphics for the Switch and all the in-app purchases from the mobile phone have been eliminated. So, basically, you will get a better looking game that doesn't have in-app transactions. TBH, the game looks very good and for what I played on the mobile phone I quite enjoyed it. However, I will wait for the reviews first to check if it's worth the money. The devs have a lot of experience with racing games so I guess the game will be good. I wish this was $19.99.... I really want a nice racer (other than the amazing Mario Kart of course) but $40 is just too high for what I am afraid we will get. Honestly, I don't understand why everyone is condemning this before they've even played it or read a proper review just because it started out as a mobile game. From the looks of it, the game has been completely retooled to be full fledged console game. From what I understand, they've turned up the graphics, they've obviously redone the input system to accommodate physical controls, and they've added a whole lot of content. Of coarse the "free-2-play" mobile version was crap, most mobile games are. If these guys can turn what they have into a full on console sim, I really don't see any reason not to give it a fair shake. Gamestop (US) has the retail exclusive and has it available for pre-order for $49.99 for 11/21 release. I love racing games, and this one looks like an updated version of Roadsters (N64), which is fine by me. $50 retail is a bit steep, but Christmas is coming . . . .
1) Not enough cars compared to other racing games. 2) Not a realistic racing game but more arcade-y. @Racthet916 Because it’s still the same game, just without micro transactions. It will play exactly the same, the racing is boring as the ai and driving model is rubbish. @Hughesy While it's obviously the same game at it's core, I think it should be noted that the AI was likely tuned to cater to the limitations of touchscreen/accelerometer controls. If it truly ends up being the same game minus the paywall, I won't be giving it a go either. However, if the developer has reworked the driving model and AI to be more in line with console expectations, I see no reason to overlook it just because of it's roots. I’m so excited! Def getting the physical one. This will be a purchase based on the reviews for me I think. It will have to be silky smooth. It would be good if it had real world physics in terms of collisions. Not keen on realistic looking driving sims where you can collide with everything and anything and not pay the consequences. @Hughesy Oh, I see. you’ll have to forgive me. The most realistic racing games I tend to play are Mario Kart and F-Zero, haha. To me, anything with a real world car seems like a realistic racing sim. Ah. I might have taken a pop at the physical version but the exclusive nonsense will probably make that impossible. Ah well, back to the Forzas. @Hughesy "It will play exactly the same, the racing is boring as the ai and driving model is rubbish." You say that as if you've already played the Switch version. Why not give the developers a chance? And does anyone know when a racing simulation game was on a Nintendo console? And if yes: Which one, which system? @SLIGEACH_EIRE It's a free-to-start game on mobile. It is not FREE. I repeat it is not FREE. @Grauz That's for the US. It's had its release date there moved forward. @admwllms Jump to 1:14 in the video, there appears to be a hood-cam type view. Not the same as in-car, but certainly a better option if you don't like behind-car views. @Racthet916 oh great yeah thanks for the heads up, that's definitely good news and makes me a lot more interested in the game. I know it's picky of me but other than Mario Kart I'm really not a fan of behind the car view in racers. I thought it played well too, but I personally found the textures too bland even for a racer. Though, I have to admit the physics did feel good from what I played. I'll keep an open mind and eye on it. Wow looks decent! And hooray more boring 60FPS chat. The closest I can't think of is World driver Championship on the N64. But I can't remember if that had real cars or not. Actually maybe Auto Modelista on GameCube counts though I don't think it was very good. @Hughesy Gear.Club unlimited on the switch looks to be way ahead of iOS Version. I don’t think its a mobile port, looks like it’s a entirely new game for the switch that is from the same franchise than the mobile game. If there was a forza or Gran Turismo Mobile game that wouldn’t mean that console version would be the same as mobile. Wow, this game looks legit. Like, full $60 release legit. Certainly $40 worthy. Which, the physical version is like $5 or $10 more than that- a reasonable tax in order to get a physical version on cartridge. But really, I'm impressed with how great this game looks. The graphics look terrific and the arcadey gameplay is in line with Forza Horizon series. Games like this are really filling a void on Switch- I want a game like Forza Horizon to play on a handheld. This might not be quite as good but it certainly looks respectable enough. Don't remember that. Was it good? Ah...yes, I remember. Didn't get it and forgot about it. Looks cool. So many games coming out, this may have to wait though unfortunately. Me too, however, really I miss games how classics (90's) Need For Speed (upsi, yes, I repeated this several times before), where those games were mix of arcade with sim racing (yeah, more arcade, but still with some of sim. ), original music (no license music, and really for racing games...) and real challenge (traffic, police and enviroment tracks) plus many options for single player and with great "replay value"
i just noticed the other day that cars in rallies do drift in real life. that was a revelation. @Switcher yes i really loved that game. They did a great job on it, it looked and played really good. @Ervex_109 Because it’s literally the same game, not sure how that’s hard to grasp, if it was a different game it wouldn’t have the same content, same name and same gameplay. @Spoony_Tech That acclaim should probably go to NFS Most Wanted on Wii U. @Hughesy But it isn't the same game. Enhanced graphics (Compare the iOS game to the above video - the differences are stark) and no 'freemium' payment system (All features unlocked) indicate as much (Hence the 'Unlimited' in the title, so not the same name at all). You're essentially paying upfront for the extra cars, tracks and other additions instead of in-game, as well as the time taken by the developers to graphically build upon the original release. On top of this, you get the ability to play on your home TV, with a controller you're familiar with against your friends and family. What's not to love? I'll wait for reviews but what I can say is this at least seems like a better overall product than Gran Turismo Sport, and I'm a big PlayStation fan and used to love the GT series until recently. @Hughesy I never took your comment as snobbish. I enjoy being enlightened. No worries. @carlos82 it is built for the switch. Think of it as a deluxe. 400 races on 200 tracks. That is a lot more than a mere mobile game. @Racthet916 Look what they all did to the Rabbids game, that thing was dead in the water before it was even given a chance to swim. Real wise for them to address a big gaping hole in the Switch library...Racing Games! Knowing this, perhaps they can be a bit bold and charge a higher price then most would agree with. But besides MK8 deluxe there’s literally nothing else out there on Switch. Trailer looks great. I also feel Eden is a solid studio with a good reputation and so I have hopes that this will be a solid game! If it is, then they deserve good sales for filling a huge void! On my radar!! Is this actually going to be any good? I’m getting more and more sold on it. I really want details on the DLC, though. The car roster could use some serious fleshing out. If they give us a demo then I can make a better decision. But based off playing the mobile version, it's a truly and amazingly and beautifuly crafted work of arse. @Lord It will have online. Glad someone remembers Roadsters! I liked that game at the time. Game looks like a total retro through back to the classic Need 4 Speed games of PSX and PS2 which I am totally for. It's got 200 tracks, 400 + events, a cool car customizing shop, the only thing it's lacking is number of cars, only has around 30, hopefully some more will be added via DLC. People need to understand the difference between the mobile game and this. In the mobile, which many people loved, you had to spend a lot of money to really unlock things. For $40 bucks you get the whole game open from the start, with no more money required, you know, like a REAL game. So for any one to ask "why is the mobile free and not this", you really have no clue what your talking about, as the mobile version is far from free. On top of that, this features 4 player split screen multiplayer, improved graphics, no micro transactions. This is not the best looking racing game on earth, it did start out as a mobile game, so the environments are a bit on the lower polygon side, but they look nice, and have a retro feel to them. Also like the fact that this is track/point to point races like the classic Need 4 Speeds. Over all its a nice arcade racer that looks nice and is a great through back to the classic racers of the past. Totally happy it's released date got pushed up as well. CAN SOMEONE TELL ME IF THERES MANUAL SHIFTING IN THIS GAME? !